Our product range includes a wide range of expansion joint sealant algiseal psd, seal acrylic algiseal acrylic and crack filling sealants algiseal acrylic gp. We are providing excellent quality of Seal Psd Tiles Joint Filler to our customers. It is a polysulphide sealant for filling of expansion joints with maximum of +/- 25% movement. We offer the highest quality of Acrylic sealant to our customers. 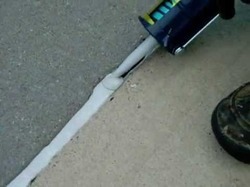 We are engaged in providing the highest quality of Crack Filling Sealants to our customers.